The Woolly Brew: felted shoulder bag - I still need closure! felted shoulder bag - I still need closure! This tip will give you some ideas on how to fasten your Felted Shoulder Bag once it has been felted. You can find another idea here. This idea uses the threads in the embellishment kit that you get with your Felted Shoulder Bag kit to make a twisted cord. You attach the cord to the back of the bag and then loop it around a button on the front of your bag to close it. The two buttons in the embellishment pack were sewn to the front of the bag - the smaller one on top of the larger one. 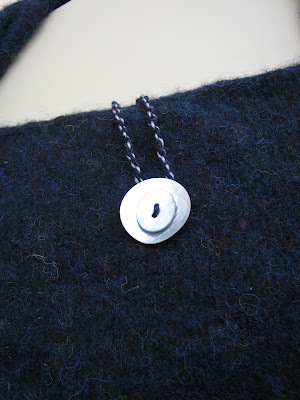 You can use wool leftover from knitting your bag or a strand of thread from the embellishment pack. Using a combination of the threads, even some more leftover wool, make twisted cord. You can print instructions on making twisted cords from the Sirdar website here. Or view a photographic tutorial on about.com here. Take your twisted cord and make a loop, adjusting the length to fit from the back of your bag to the front - make sure the loop can fit snugly around the front button. Sew the loose ends of the loop neatly to the back of your back. Ours is attached near the top. Trim the ends if you like or leave them loose, you could also sew the smallest black button in your embellishment pack on top of the loose ends to hide them. If you don't fancy making a twisted cord you could just use a strand of leftover wool - attaching it in the same way as the twisted cord. Or you could plait three strands of wool together to give a thicker loop. Watch out for more ideas on how to personalise and embellish your Felted Shoulder Bag!